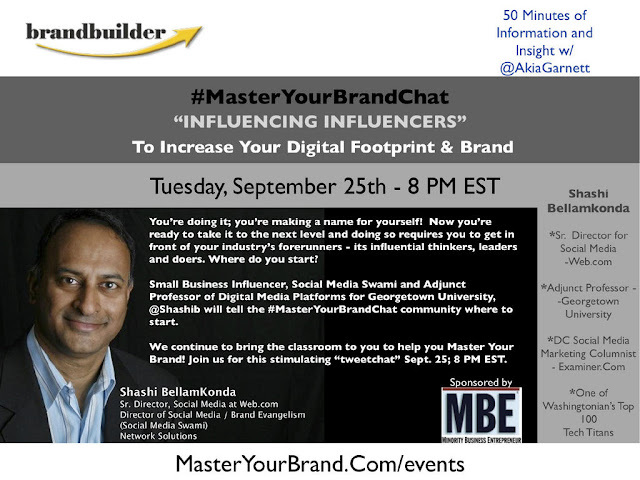 Chat Tomorrow Night Sept 25th 8 p.m #MasterYourBrandChat | Happenings, Marketing and Technology Advice and Thoughts! The term "influencers" can be often misconstrued to mean celebrities only. This could have been true in a media that was a one way broadcast and no engagement. Simply defined anyone who has the power to change or effect opinions or behaviors can be an influencer. In childhood our parents are influencers as we grow friends, family and colleagues become influencers. In today's connected world you could be influenced by a detailed review on Amazon or Yelp, or reviewers on blogs. As a business owner how would you "Influence the Influencer"? How would you find them? Do they matter to your business? What are your thoughts?